File this one under, Things Financial Services Companies Don’t Want You to Know. Credit card debt. The three dirtiest words in our society. (Well, depending on what you’re into.) Most of us have it, or have had it, at some point in our lives. In fact, more than 38 percent of American households have credit card debt and owe an average of $16,048. Let’s say you’re one of them and you’re dutifully making your minimum balance payments each month. Good, right? Well… sort of. 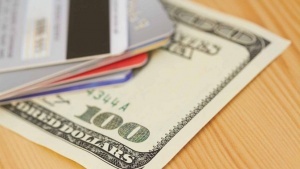 Do you know how credit card companies calculate your minimum payment? Many companies determine your minimum payment as a percent of your total balance, usually around 2 to 5 percent. * Worth noting: minimum payments can change, and are not typically set in stone. Regardless, let’s say you owe $5,000 on a credit card. Your minimum payment could be something like this: $5,000 x .03 = $150. Which means you’ll pay $1,800 over the course of a year. Seems pretty upfront. Until you consider your card’s APR, or annual percentage rate. This is essentially how much interest you pay on your balance each year. The average APR on a credit card is about 16%. Usually, rates are set for a period of time but can be raised if you do something like miss a payment. So, on a $5,000 balance, you’ll pay about $800 in interest each year. So that means that only $1,000 of the $1,800 you paid toward your credit card over the year will go toward your principal balance. The other $800 will go toward – you guessed it – interest. Which means that by paying only the minimum balance, a good chunk of your payments are going toward paying interest, not actually paying down your debt. Here’s the truth: Credit card companies don’t care about helping you pay off debt faster. They care about making the most money possible off you. And how do they do that? Interest. The longer you pay on a card, the more they make. *Worth noting: Companies differ on how they calculate minimum payments, so be sure to check the fine print of your credit card statement. It will probably be listed under FAQs, something like: How is my minimum payment calculated?